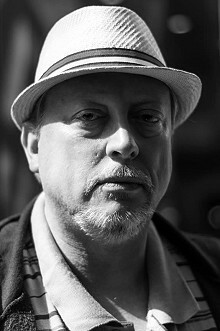 American horror writer Tim Waggoner is a tenured Associate Professor of English. He teaches composition, creative writing, and serves as the department's Coordinator of Creative Activities, overseeing the writer's workshop, the literary magazine, and the creative writing course sequence. Sure. Getting feedback from readers gives me a better sense of which of my stories and narrative approaches works for them and why. For example, I've had so many people tell me they enjoy my Nekropolis series and ask for more books set in that world that I plan to do more. The positive response to my horror fiction from fans has encouraged me to continue focusing my efforts in that genre, and especially in the area of surreal horror fiction that I've carved out for myself. It always helps to be reminded that there are real people on the other side of the keyboard who will read your work when it's finished. It reminds me to continue striving to make each sentence better than the one before it. During a signing, one gentleman brought me a copy of Nekropolis to sign for his wife. He told me it was a late birthday present for her, and that he wanted me to apologize for it being so late. I asked him if he wanted me to write in the book that HE was sorry it was late, and he said that he wanted ME to apologize. So I wrote, "Sorry your husband got you a birthday present so late," and then signed the book. There have been so many influences but some of the writers I find myself returning to over the years are Dennis Etchison, Ramsey Campbell, Shirley Jackson, Charles L. Grant, Thomas Ligotti, Caitlin R. Kiernan, Jack Ketchum, Steve Rasnic Tem . . . More recent influences are Laird Barron, Alison Littlewood, Simon Strantzas . . . The films of David Lynch and Dario Argento have been big influences, and I've recently enjoyed Mike Flanagan's films. Lovecraft's work - not so much the Mythos or his style but his distinct imagination - has also been an influence. Salvador Dali would be fascinating to talk to. I'd love to get a sense of how his mind worked. I'd love to have a conversation with Groucho Marx. He not only was one of the funniest people who ever lived, he was an extremely intelligent and thoughtful person, and he'd be a fantastic conversationalist. Maybe Marilyn Monroe. She's become such an iconic image over the years, and it would be fascinating to get a sense of the real person behind the pictures. An ultra-conservative, racist, sexist, homophobic, anti-government, anti-poor, intolerant Christian gun nut. I'd take as many digital book and movie files as I could. I'd go crazy if I couldn't have access to stories. I'd also pack a laptop because I'd go even crazier if I couldn't write! I want to learn as much as I possibly can about the art and craft of writing, and about myself in the process. I also hope to add my own unique contributions to the field of horror/dark fantasy/weird fiction. Discovering that a reader has enjoyed one of my stories is the most satisfying. Finding out that one of the crazy ideas I've come up with for a story actually works and that readers get it is another satisfaction. Solving a particularly difficult story problem - especially when I write myself into a corner and have to find a way out of the situation I've placed myself in - can be especially satisfying. It's frustrating and fun in equal measures. Finalist for the Shirley Jackson Award for Long Fiction, 2011. Two-time finalist for the Scribe Award given by the International Association of Media Tie-in Writers in the category of Speculative Original, 2014, 2008. Winner of the Authorlink! Award for SF/F/H, 1998.